I’ve got a few Bare Escentuals goodies to talk about today, YAY! I was originally taking this picture with my Lip Service feature in mind but my eyes are really the stand out here. Which is a good thing because I’ve been meaning to talk to you about a few Bare Escentuals products I’ve had for a while and I used all of them when I did my makeup for this photo (I’m also working on lighting and portrait photographs and this is part of a self-portrait series I’m working on for myself). I waited to talk about these products until they were available or about to be available in stores because who wants to hear about something great that they can’t buy? Not I! First let’s talk about primers. I’m wearing Bare Escentuals Prime Time Brightening Foundation Primer and I have on Bare Escentuals Brightening Prime Time Eyelid Primer on my lids. I’ve been obsessed with primers for the last year or so and truly believe that if you want your makeup to look fresh and stay fresh all day, you have to start with a great primer. Bare Escentuals Brightening Foundation Primer glides on smoothly and gives my skin a light glow before I even put on my foundation. It’s a definite must if you really like that dewy look to your makeup, it’s not going to leave you matte but it will give you a soft light to your skin. 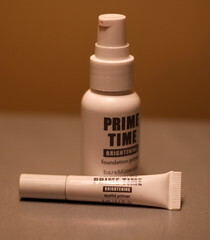 The Brightening Prime Time Eyelid Primer is now at the top of my list for eyelid primers. Why? Because you could really wear it alone and still have soft gorgeously glowing lids AND because it lasts all day long. Seriously. This primer will add a sheen to any shadow you put on top of it that is so beautiful when you apply it straight from the tube you might not even want to wear eyeshadow! I also feel like once you put this primer on, your eye makeup is not going to budge. I wore it with Bare Escentuals loose shadows and every other brand I have in my makeup drawers (and I’ve got a lot) and it had my eye makeup looking fresh from sun up to sun down. 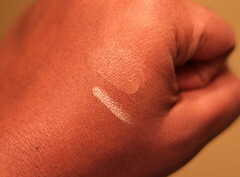 Here’s what the eyelid primer (left) and the foundation primer (right) look like on my skin. I put a heavier portion on my hand just so you could really get a sense of how shimmery they are on the skin without any makeup or eye makeup applied. 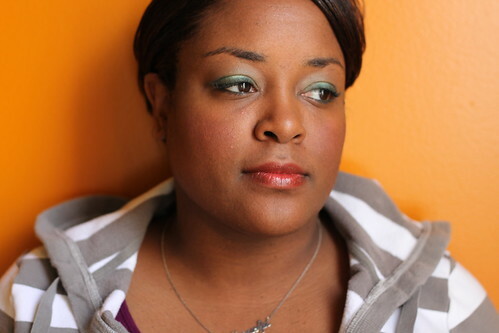 The soft glow of the eyelid primer really is a great base or just beautiful on its own. LOVE IT! Now the second product I want to talk about is a Sephora Exclusive, the Buxom Waterproof Smoky Eye Sticks. When I got these in the mail it was just after I had a conversation with a girlfriend about how we love a smoky eye but sometimes that black shadow gets everywhere and you spend more time cleaning up the smoky aftermath than you do applying it to your face! There have been other smoky eye “sticks” that I’ve tried and hated in the past but seriously, this is everything you need. This neat little stick can line your eyes, act as an all over shadow or become the smoky layer in your beauty routine. There’s also a neat little blending brush that is perfect to blend the color into your crease or help to blend the color across the lid. I’ve been hooked on this product for the last month creating different looks in every color they have and for the picture above I used Bow & Arrow, a gorgeous mossy green over Envy glimmer. 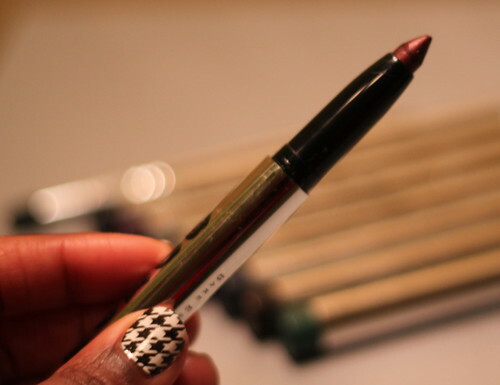 This stick is a beauty powerhouse and if you’re ready to take your eye makeup to the next level, I think you need this in your makeup arsenal. Seriously. Oh and did I mention it really, really lasts? It’s not a secret that I love Bare Escentuals and their Buxom line but with products that are this fantastic, would you really blame me? So have any of you seen these products yet? Who is going to give them a try?! These smoky sticks are just what I’ve been looking for! The black shadow I use has me looking like a raccoon and I feel like I can’t clean it up without removing all of my makeup. I will definitely be picking some of these up ASAP!! I was contemplating buying one of these recently, and I think you convinced me. I wonder if they have them in Ulta too (closer to my office)…. BTW, your houndstooth nail polish (or is a sticker?) is fantastic! !